Charles Wellington, one of the great cartoonists of the 1900-10s in my opinion, was so delightful with these small panel features that I wish he had never found his lasting success with a strip, Pa's Son-In-Law. His strips just don't seem to allow for the same sort of keen observational humor I enjoy so much in Why Is It, There's A Reason, And The Worst Is Yet To Come, and others.Why Is It was sometimes a strip, but of course I like the panels better, hence our sample. Why Is It is one of Wellington's earlier efforts -- in my very limited batch of samples it seems to have begun and ended in late 1906. The syndicate was uncredited, but it seems a reasonable assumption that it was World Color Printing. In fact, World Color Printing reprinted Why Is It on their weekly black and white pages of 1919. This sample panel is timely if you happen to live in my area. The city of Leesburg, in an attempt to support the self-reliant type of folks, has just passed an ordinance than you can keep up to fifteen chickens in the yard of your in-town home. I presume roosters are strictly verboten, but even hens can make a bit of a ruckus when they get in a dither. I applaud the idea of residents keeping chickens for the free eggs, though. I'd keep them myself if it didn't tie you down to being around every day to feed and water them. 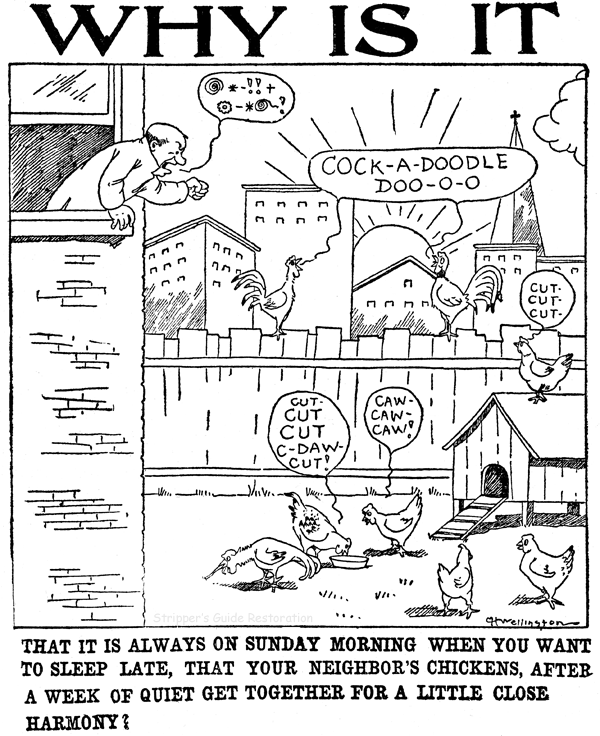 And speaking of chickens, I wonder when the sound they make was standardized as 'cluck, cluck'? Wellington's 'cut-cut' take on their sound is probably more true to life, though.